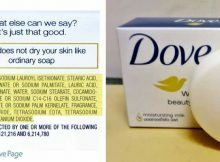 Home Unlabelled DOVE’S ‘REAL’ BEAUTY PRODUCTS ARE FILLED WITH CANCER-CAUSING CHEMICALS, FAKE DYES AND TOXIC FRAGRANCE. People, let’s face it – nobody enjoys beauty ads. And yes, I really think that we can all agree on that, right? Why – well, because the models selling the cosmetics, face creams, or hair products always look condescendingly perfect. It doesn’t help that we know they are produced by makeup artists and animation wizards. And I also think that their flawless skin causes us to frown upon our own blemishes and wrinkles. And their slim bodies make us self-conscious about our own weight. Their luscious hair makes us feel bad when we think our hair is too thin, too puffy, too curly, too frizzy, or too much anything. Then we go out to buy whatever the model is selling because we are desperate to be perfect just like her. Of course, we would never admit that aloud, but that’s how we feel. But, you probably know that the Dove campaign is different. Why – well, that’s easy to answer! Because the models they use are real women and girls just like us. Dove ads feature real people talking about their insecurities about their looks and bring them to realize they are beautiful the way they are. It warms our hearts and makes us feel good about ourselves. And, what do you think – what’s the main reason we all buy Dove products? Well, we can answer that question for you – we buy Dove because we’d rather listen to the company that tells us “you are already beautiful” than the ones who scream “you are ugly and that’s why you need this product right now!” For the company that advertises “real beauty,” we’d expect them to use natural ingredients. However, many of the Dove products feature toxic components! Here’s what you need to know – this cosmetic company began in 1957 when the Lever Brothers produced an original ‘beauty bar.’ They advertised they product was ‘much better for your skin’ as opposed to other soaps because it was mild and contained ‘one-quarter cleansing cream.’ Their logo featured the bird silhouette that we see today. The models were typical for beauty ads at the time, slender, red lips, and girly. And, after some time, in the late 60s, Dove began to advertise with ‘real women,’ testifying before a supposedly hidden camera about Dove’s soap bar moisturizing effects. Well, these testimonials (in the late 80s) evolved to focusing on one woman ‘Jean Shy’ who reflects on a compliment someone gave her about her skin after using Dove. This is the first shift of the company to promote inner beauty. In 1991, the “Litmus tests’ began, advertising the low alkalinity of Dove’s soap. ‘Dove is mildest. Bar none.’ This campaign went worldwide. Dove began selling new products such as deodorants, body lotions, cleansers, and shampoo. Hand and face care merchandise followed a couple years later. Did you know that the official Dove Campaign for Real Beauty website was launched in 2004. The next year, in Canada, the Dove Self-Esteem Fund was initiated to combat eating disorders. They began to release videos such as ‘Evolution’ which displays the unrealistic portrayal of beauty from the media, and ‘Onslaught’ which features the torrent of pressure from the press that consumes innocent little girls’ body images and self-esteem. This is when Dove truly entered our hearts. And I also think that we can all agree that today, Dove is the world’s number one cleansing brand. Their sales are over $2.5 billion U.S. a year, in over 80 countries, where countless girls and women began to feel more confident about their looks and bought the products of the company that supports their individual beauty. Water (Aqua), Cocamidopropyl Betaine, Sodium Hydroxypropyl Starch Phosphate, Lauric Acid, Sodium Lauroyl Glycinate, Sodium Lauroyl Isethionate, Hydrogenated Soybean Oil, Glycine Soja (Soybean) Oil or Helianthus Annuus (Sunflower) Seed Oil, Sodium Chloride, Glycerin, Fragrance (Parfum), Guar Hydroxypropyltrimonium Chloride, Dmdm Hydantoin, Stearic Acid, Citric Acid, Bht, Tetrasodium Edta, Methylisothiazolinone, Iodopropynyl Butylcarbamate. Here are ingredients rampant in Dove products and what they truly can do to your body. Methylisothiazolinone– many different studies have discovered that this chemical is responsible for neurodegenerative disorders and seizures. They are looking to conduct further research on this toxin. Fragrance/Parfum– first, you should know that this is a common skin irritant and the leading cause of dermatitis from cosmetic use. Studies suggest that this is rising skin sensitivities. Tetrasodium Edta– first you should know that this ingredient is made from formaldehyde, a known carcinogen. Also, it is a penetration enhancer, meaning it dissolves the protective skin barrier, pathing the way for other toxins to sink into your tissue and perhaps even your bloodstream. Although the Cosmetic Ingredient Review Expert Panel deemed this chemical “safe,” since it is not well-absorbed into the skin, they did suggest caution when mixing this preservative with other hazardous ingredients. if you’re a vegetarian, then you shouldn’t read this! The experts say that Sodium Tallowate, featured in the classic Dove Beauty bar, is derived from the fatty tissue of cattle. The FDA declared this additive to be safe, but according to them, GMOs are fine too.